Here's a calendar that features key dates for the year ahead, and also listed below are the ESC term dates. At East Surrey College we offer a wide variety of activities that you can participate in outside of your academic timetable. This might involve taking part in sports activities, joining the Student Union committee to design the enrichment programme for the academic year; working on community or charity work or volunteering to support your local community. The Enrichment team also offers support to students applying for Higher Education courses and for those seeking employment. We are always looking for new ideas to include within the enrichment programme; therefore any ideas or suggestions would be greatly appreciated. Enrichment is about meeting new friends and developing skills and fun times. Get involved this term with our exciting activities programme! Taking part is a great way of meeting new people, learning some new skills and having fun! 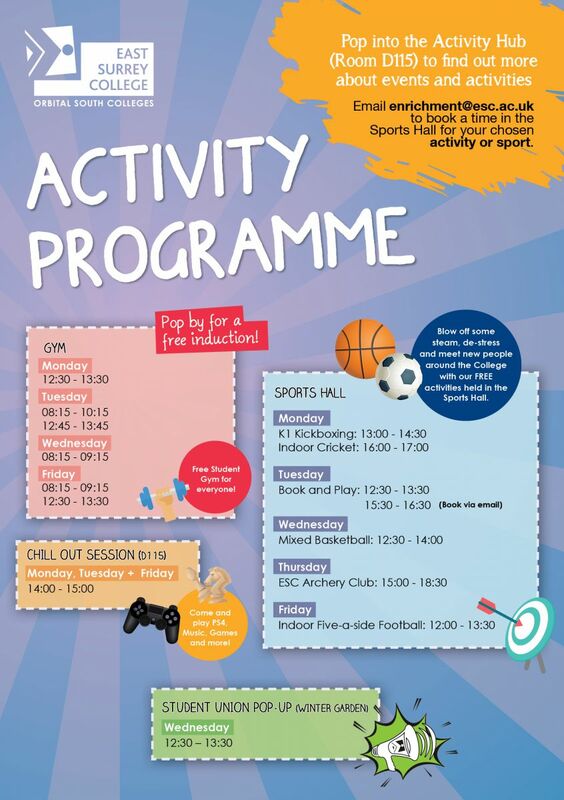 Email enrichment@esc.ac.uk for more information about activities or pop into the Activity Hub (Room D115) - Activities are free for all students!